Humans are fascinated with Mars, our closest Earth-like planet. With nearly 30 successful missions to Mars over the past five decades, one may assume that we have discovered all there is to know about Mars' surface. This is far from true as the mysterious surface slope streaks show. These features differ in size and shape, and seem to appear at random times and places. Scientists think they form via a wet or dry process, although it could be both. If a wet process causes them, this could have far reaching implications for finding extraterrestrial life on Mars and for future resource utilization missions. The Viking orbiter first captured high resolution images of the Martian slope streaks in the 1970s. Slope streaks are prevalent surface features seen across the equatorial and sub-equatorial regions of the planet. They form in regions of dusty regolith with low thermal inertia, and have a much darker appearance than the lighter area around them. Some common slope streak shapes include straight lines, curved lines, fan shapes, and splitting shapes. Observed sizes range from a few meters to several kilometers. Slope streaks usually start at a higher elevation point and widen the further down they extend. This mimics how a flow or mass moves downhill. However, they have been reported to climb a few meters over obstacles. Slope streaks appear to be singular events and rarely grow after initial formation. Slope streaks are hypothesized to form between a few minutes and several hours. The lack of constant observation prevents exact estimates. Their lifespans vary, but they generally fade away within ten years. Recent studies using high resolution imagery have identified several hot spots of slope streaks. Many of these streaks have similar slopes, which will help constrain the process of their formation. The scientific community is divided on what process causes the slope streaks to form. There is general consensus that the surface streaks are caused by some flow or mass movement. The divide comes from whether this movement is due to a dry mechanism or a wet mechanism. The dry mechanism assumes some type of dust avalanche moved material downhill, creating the slope streak. Potential sources for these avalanches include subsurface debris movement, air fall deposits, subsurface melting, or localized disturbances (rockfalls, impact blasts, or quakes). Unsolved questions with a dry mechanism include why most slope streaks show undisturbed topology in orbital imagery, why there is no observed debris accumulation at the edges of the streaks, and how a dry mass movement can extend for kilometers. A wet mechanism assumes some type of water based mass movement. Potential sources include transient groundwater springs, melting frost/ice, or seasonal seeps of chloride brine. Unsolved questions with a wet mechanism include explaining how the slope streams move over obstacles, why these streams don't show seasonal changes globally, and why the streaks lack universal consistency between occurrences and bedrock geology. Some of these questions are still unanswered or only partially answered. To answer some of these questions, scientists need more orbital observations, higher resolution orbital imagery, increased understanding of the Martian climate, more laboratory simulations, and better computational models. Trying to use terrestrial analogues to study slope streaks is difficult because the terrestrial environment is much more dynamic than that found on Mars. However, all reported terrestrial slope streak analogs have been proved to be from aqueous processes. Observations of the Salar de Uyuni in the Altiplano of Bolivia is one of the best analogs for Mars. The region is the largest salt flat on Earth with an area over 10000 km2, and is at an altitude of 3653 m (~12000 ft) above sea level. Winters in this area usually receive no rain and average a low temperature of -7.5 C (18.5 F). Satellite imagery shows seasonal slope streaks emerging over the winter. These slope streaks are caused by aqueous brine. Even with terrestrial analogs, the Martian slope streaks could still be caused by a dry mechanism. One potential is that they are caused by a combination of the dry and wet mechanisms. A subset of slope streaks could even be caused by one or the other. Determining the source of the Martian slope streaks is important because if proven to form from water, this would be one of the few sources of liquid water in the equatorial regions of Mars. Finding liquid water on Mars means there is potential for finding extraterrestrial life. Extreme care must be taken when future missions decide to visit one of these locations. If water is the culprit for these formations, understanding where and how the water causes them will be very relevant for resource utilization missions. Currently the slope streaks appear random, but understanding the mechanism of their formation will help predict where they are likely to form. This could then be used for future missions that wish to process the water into fuels and other products. The potential for liquid water to exist in equatorial regions is huge. This is a two sided coin, however. Having liquid water is these regions is great for resource utilization missions, especially for human bases. Yet we must proceed with caution, as these equatorial water sources could contain extraterrestrial life. Bhardwaj, Anshuman, et al. 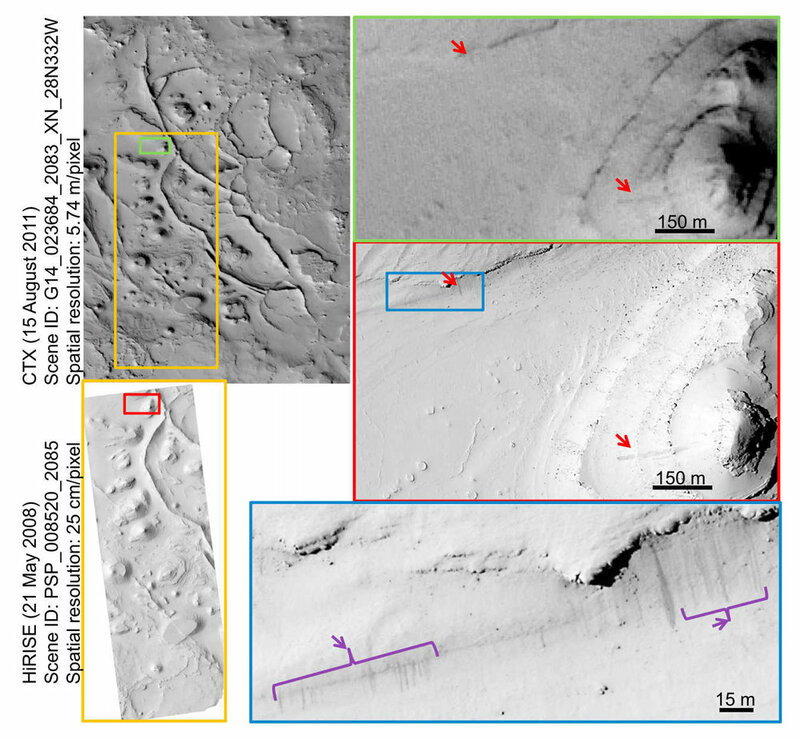 "Are slope streaks indicative of global‐scale aqueous processes on contemporary Mars?." Reviews of geophysics (2019). Link.